Larry and I got back from vacation a few days ago. While we are still recovering from jet lag, we jumped back into our lives. The dogs need to be walked, and laundry awaits. As I listen to the wind outside and watch the temperature drop, I remember the warm breezes of the Big Island of Hawai’i. This was our first time in Hawai’i and we decided to get a bit off the beaten path. No beaches for us. 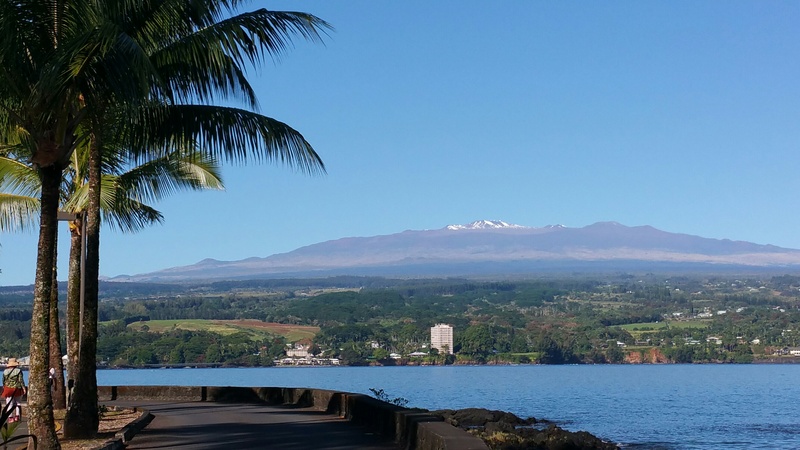 On the Big Island we were greeted by highly changeable weather and micro-climates, and found common ground with the people we met, both tourists and residents. The population is diverse. Native Hawaiians live beside mainland transplants looking for warmer climes, descendants of Chinese and Japanese immigrants, and every other race and creed. 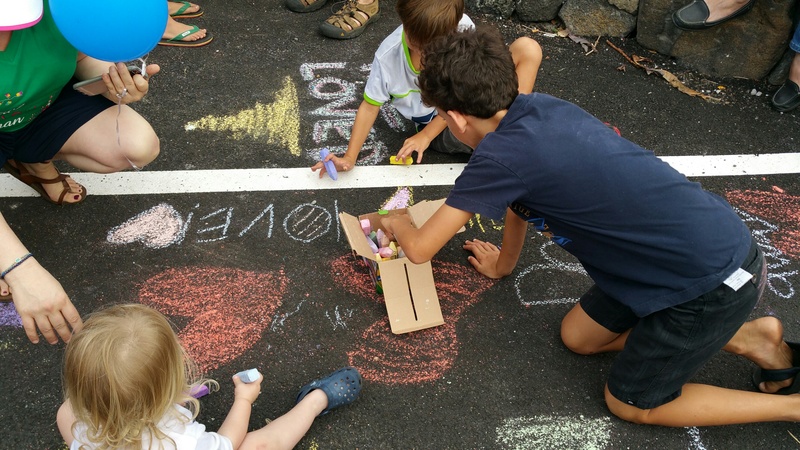 We learned that Hawaiians are not shy about expressing their opinions. 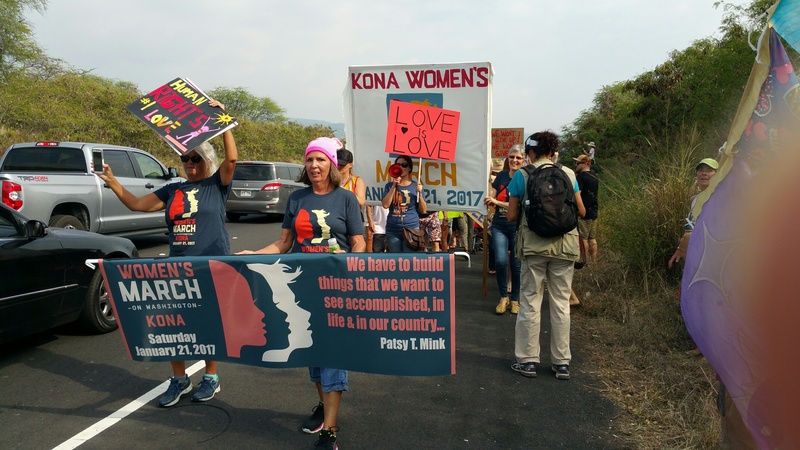 They were enthusiastic participants in the Women’s March on Washington in Kona. I think this may have been the last Women’s March in the world. 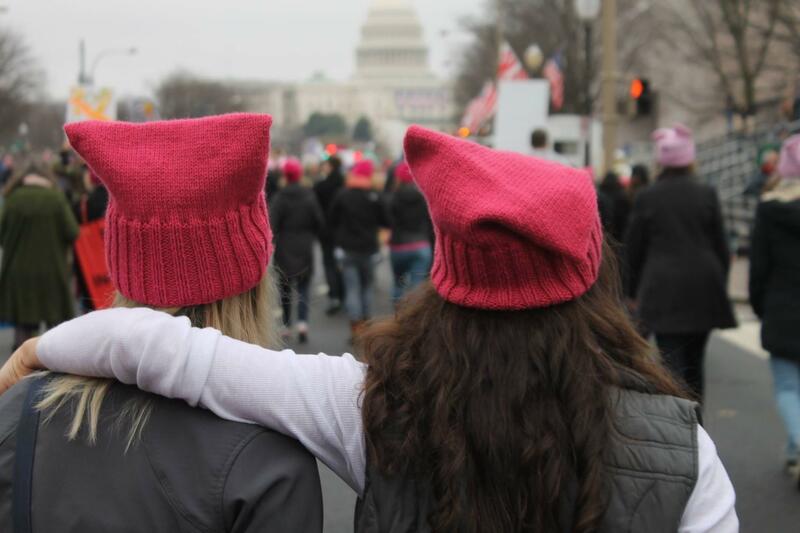 We joined in, and my pussyhat came along for the ride. When I first learned about the Women’s March I suggested to my dear husband that we postpone or cancel our vacation and instead go to the march in Washington, D. C. I won’t repeat the look on his face or what he said. My response was something akin to “you have to get your priorities straight. What’s more important, vacation or standing up for women’s rights?” You know which side I stood on this argument! Our compromise was to keep out reservations and look for a local march. To our surprise, there were three marches on the island of Hawai’i. Kona was the closest, so we blocked off part of the day. Luckily I had already packed my “nasty woman” t-shirt and pussyhat. Like good rule following citizens we signed up for the march on their Facebook page. After a morning of exploring a lava tube (more on that later), we took a shower and headed for Kona. The organizers had provided helpful parking suggestions, which we dutifully followed. After leaving the parking lot we noticed people heading down the street and figured they must be going to the march. Fifteen minutes later we arrived. The organizers sent us to the back, but first I took this picture of the front of the march. We were told that 500 had signed up for the march, and that 3000 had turned up. The venue for the after march rally was much too small. Some of the marchers decided to go home, but many more stayed and listened to speeches by local activists. 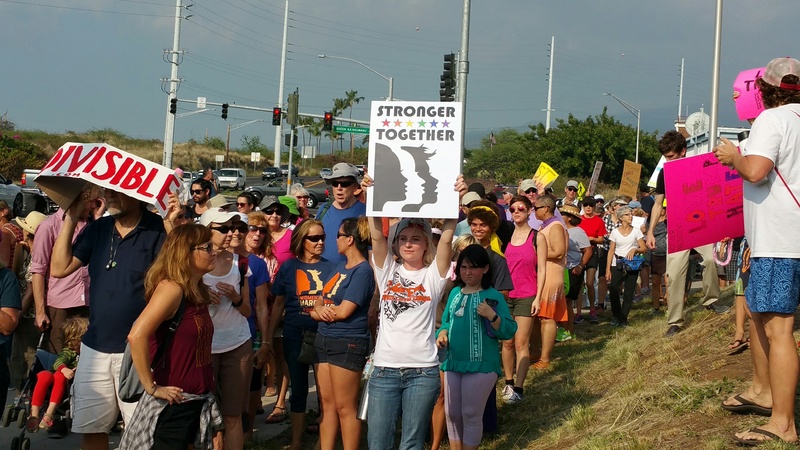 It was the Women’s March Hawai’i style, with shorts and sandals, and speeches interspersed with Hawaiian words and sayings. 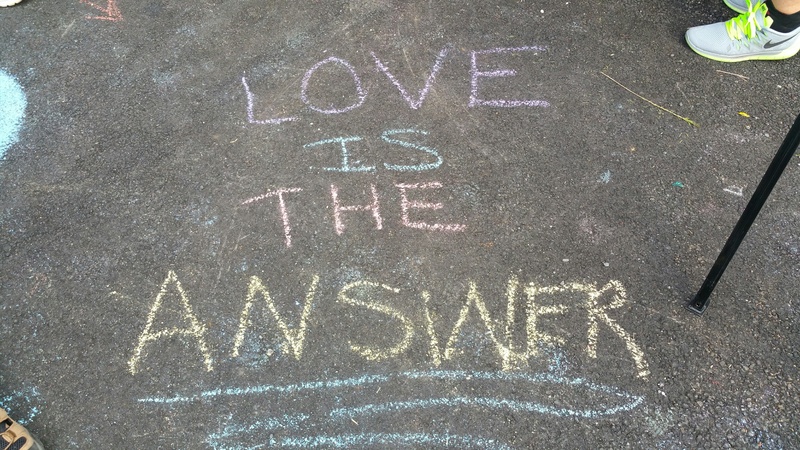 There was even something for the kids, who crouched outside with a bucket of chalk and drew pictures. At the end of the day, maybe we need to look to the children to lead the way. Marriage is all about compromise and doing the march in Hawa’ii is pretty cool! Yes indeed, compromise is necessary to maintain a happy marriage. I have not yet convinced him to wear a pink pussyhat, but still working on it. HA! and a good sense of humour always adds spice!